A site or two far to the south. Episode: 70. Site Numbers: 277, 417, 418. Date Posted: 23 January 1999. Location: Santiago, Chile. Type: Various. On the way to the Antarctic recently I found myself in Santiago, Chile, and spent a good part of a Sunday tracking down some 'Low-Latitude' sites in that impressively modern and bustling city (much more so compared to my last visit 30 years ago). 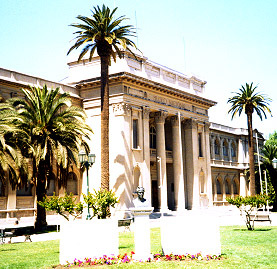 I started off by going to the Museo Nacional de Historia Natural (Natural History Museum), Quinta Normal, Casilla 787. Founded in 1830, the museum (418) is housed in a large, classical building set within a pleasant park just west of the city center. On the ground floor, to the right as you enter, are several polar exhibits: a diorama or two featuring penguins, skuas, albatrosses and petrels; an array of reasonably modern scientific equipment; archaeological items from the South Shetlands including a small metal pitcher, candlestick, door latch, oil can, glass bottle, and the like; and something labeled as the skull of of an Arctocephalus gazella. My next stop was the Club de la Union (277), an even larger architectural ensemble that would not be out of place in London and taking up an entire block (between Bandera and Nueva York) on the Av. Bernardo O'Higgins, Santiago's principal thoroughfare. 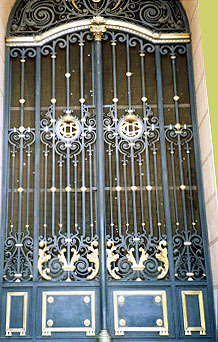 Being Sunday, the handsome and elaborate iron gates, with their gold emblazoned and intertwined "UC"s, were shut tight. This club--from the looks of it the city's biggest and most exclusive--was the venue for an October 1916 post-'Endurance' dinner for Shackleton and his men. The honored guests included (according to an autographed menu shown in Harding Dunnett's book, Shackleton's Boat; The Story of the James Caird) Shackleton, Worsley, Hussey, Crean, James, Marston, Orde-Lees, Rickinson, Kerr, Wild, McIlroy, Crean, Macklin and Greenstreet. It must have been a lively affair as Tom Crean signed twice! 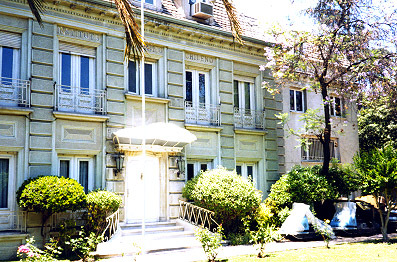 My last site that day was the Instituto Antartico Chileno (Chilean Antarctic Institute) located at 814 Av. Luis Thayer Ojeda, on the east side of Santiago. The Institute (417) is housed in what probably is the oldest building along this very pleasant tree-lined street of mostly modern, attractively designed apartment blocks. But for the snowmobiles in the front yard, behind the iron railings, the Institute's mansard roof and overall look might lead you to think you're in the suburbs of Paris. My transport on this four-hour outing was Santiago's superb subway which has to rank among the best anywhere in terms of comfort, cleanliness, ease of use and service.